Summer: I’ve never told anybody that before. Tom: I guess I’m not just anybody. I don’t think there could have been better timing for me to see (500) DAYS OF SUMMER than the precise moment I saw it. Well, last night would have been fine too but it was sold out so I had to settle for today instead. The reason I say this is because I just met someone and we just started something that neither one of us can define just yet, just like Tom and Summer (Joseph Gordon-Levitt and Zooey Deschanel) in the movie. For years, I was like Tom; I believed in the one and in love. Then, I experienced what I identified at the time as love. It went sour and so did my belief in possibilities when it came to matters of the heart and mixing those matters with other human beings. And so I became a lot more like Summer. She likes her life alone; she likes making her own destiny. After watching this modern day romance though, I think I can fairly say that I am somewhere now in between the two but I’m not sure if that’s any better. I am also of two minds on this film. It is incredibly infectious. First time feature filmmaker, Marc Webb, infuses his Sundance hit with plenty of fresh visual style and an appropriate hipster soundtrack to match. As a result, the film beams with possibility while speaking directly to all the skeptics out there. That certainly isn’t an easy dichotomy to reconcile but it teeters ever so closely toward an underlying bitter tone that every so often threatens the film’s seemingly natural exuberance. It could be argued that this is the nature of love, as hate would be its opposite and therefore naturally waiting around for when love gets flipped upside down. 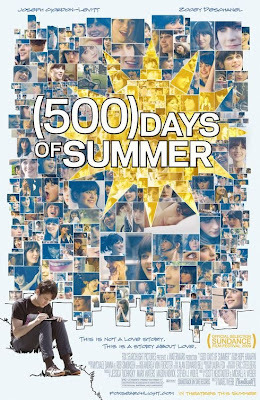 Tom and Summer just had me feeling so much joy though that I wanted nothing to do with the nastier side of things and, as the 500 days of their relationship were told out of sequence, we know the whole time that things will eventually go awry. I suppose that my resistance would mean that I may be leaning more toward love triumphant. An authoritative male narrator announces at one point that there are only two types of people out there, men and women. The statement is instantly jarring and limits the perspective of the film. Why must this love story be told from only Tom’s perspective? He is not your typical straight guy because he is sensitive and a romantic but does that make Summer’s supposedly unique perspective any less valid? After all, she is the girl who doesn’t believe in happily ever after. At times, (500) DAYS OF SUMMER is trying so hard to be different and hoping that we won’t notice that it makes it difficult for the characters to truly be real. They are mostly just their unique perspectives, and as Tom is the clear protagonist, Summer all too often ends up being vilified for what she is doing to him because she isn’t as fleshed out as she could be. Still, Gordon-Levitt and Deschanel take the somewhat thinly designed characters and make them not only believable but entirely endearing and lovable. Summer told Tom from the very beginning; she was not looking for anything serious. Tom, like most people who think with their emotions, heard her but believed what he needed to in order to appease his fluttering heart. We too were warned; the tagline from the film reads quite clearly, “This is not a love story. This is a story about love.” I should have known better than to expect anything different than what I was told to expect from the very beginning. And even though (500) DAYS OF SUMMER seems to want to break down a relationship into just the good times or just the bad times, it had enough love to remind me that it is really about all of those times combined. Maybe I’ll see it again and this time I’ll bring my date. 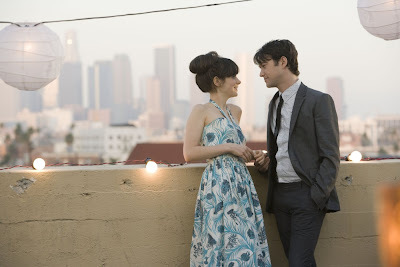 How many sheep would you give (500) Days of Summer? I like this movie a lot, it reminds me of someone. Good.. Good.. It always reminds me of someone too. I guess that’s what keeps this movie so close to my heart.